The Korey Stringer Institute has taken the existing literature and consolidated it to create 8 key points when considering state policy on automated external defibrillators (AEDs) in secondary schools. These devices can be the difference between life and death for athletes who experience sudden cardiac arrest or commotio cordis. In terms of treatment of sudden cardiac arrest or commotio cordis, use of an AED with cardiopulmonary resuscitation (CPR) is the gold standard. With EMS an average of 7-8 minutes away from the scene, the responsibility of initiating pre-hospital care falls to the on-site medical staff, coaches, athletes, administrators, or other bystanders. **The rate of survival from sudden cardiac arrest falls 7-10% for each minute without CPR. ** That would mean that if CPR was delayed even 3 minutes, the injured person now only a 70% chance of survival at best. And while CPR is absolutely necessary and important, use of an AED increases the rate of survival. This information is intended to take the most reasonable and effective current guidelines and create state policies that save lives. As sudden cardiac death is the leading cause of death in sport, having precautionary measures in place helps not only the athletes, but also the medical staff and school/event administration be prepared for the worst. Within these steps, implementation of rapid defibrillation requires consideration of the following key points for AED policies at your venue. AEDs are to be used under the advice and consent of a physician by individuals with proper training and certification. AEDs have the potential to be dangerous if used improperly or by untrained individuals. A physician should give each site where an AED is located consent to use the device. This is intended for sporting organizations and venues that have medical staff and standing orders. At venues such as heath and fitness centers, having standing orders is not a necessity, however written policies should be created which help staff and employees determine when and how to use the device appropriately. All staff at these venues should also be trained in CPR and AED administration. The policies should simply exist to help uphold the standard of care and make sure the AED is used appropriately. All athletic trainers, coaches, administrators, school nurses, and physical education teachers have access to an AED on school property and at all school sanctioned athletic events/activities. Individuals should be provided annual training and certification in CPR and AED use. At any venue where sporting events will be held or large groups of people will congregate, an AED should be available and appropriate personnel should be trained to use it. In a school setting, at a minimum the previously mentioned individuals should be trained in CPR and have access to an AED at all times. These individuals are most likely on-site during athletic events, and are the first line of care while EMS is on the way. In order to make this policy most effective, the annual training should be provided to these individuals to maintain their skills, and increasing the likelihood of survival by supporting appropriate care. Reliance on bystanders to know and be willing to implement CPR with defibrillation should be used as a last resort in terms of established cardiac arrest care guidelines. AED should be stored in a safe place and easily accessible. Institutions sponsoring athletic events should have an AED on site or access to one at each athletic venue for practices, games, or other athletic events. Since AEDs are complex electronic devices, they should be kept safe from environmental conditions that may damage them (i.e. rain, snow, intense solar radiation, etc.). However, the AED should be easily accessible in case of the need for use. It’s a major convenience to have a stationary AED that is out amongst the athletic fields; but if it’s locked in a storage shed, the delay in accessing it may be just as bad as not having an AED in the first place. On the same token, an AED which is not properly protected may not be in good service, and not useful in an emergency. The AED should be kept in a hard case or box, located at each athletic venue or centrally if several are close to each other, and it should be freely accessible (without a key or code) when the facilities are in use. Location of AED should be well marked, publicized, and known among trained staff. The AED should be easily noticeable and accessible in case of an emergency. People who use the field, specifically medical staff, coaches, and administrators should know where the AED is located, and know how long it could take to get to it. It should take no longer than 5 minutes from the time of collapse to the first administered shock. The time to get to the AED can be mitigated if signs or placards are used to: make the device more visible, inform people about the device’s location, and easily recognizable in an emergency. 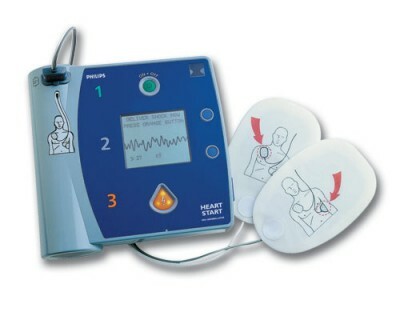 The AED should be used after enacting the EMS system. Another athletic training staff member, coach, athlete, or bystander can perform this action. AED use is a supplemental treatment until further care is on-site. Delaying EMS is a further delay in care, and should be avoided at all costs. If multiple people are on site, even those who are not trained in CPR/AED administration, EMS should be called while CPR is being initiated. EMS will ask questions about the location of the victim, the condition of the victim, and what treatments are being given. As part of an appropriate emergency action plan (EAP), see EAPs under the Prevention tab, the information should be available to give to the EMS dispatcher. That person can also retrieve the AED, if it’s not with the victim. If only one person is with the victim, EMS should be called before using the AED. If the AED is not with the victim, the AED should also be retrieved before the lone rescuer begins CPR. This is another reason why having an AED in a convenient or central location is key to survival. AEDs should be inspected frequently to ensure proper working order. This includes making sure the batteries are charged, and wires and electrodes are in good condition. No matter where the AED is located, it should be checked regularly to ensure it will be ready for use in an emergency. This should be at least monthly, if not more frequently and each check should be documented. The batteries should be checked to ensure they are charged and ready for use. The wires and electrodes should be kept intact and checked for expiration date. An additional kit of supplies should also be kept with the AED, if possible. The “AED kit” should include: the AED with electrodes, child electrodes, a CPR mask/barrier, gloves, scissors, a razor, a towel, antiperspirant (to reduce sweating and aid pad adherence), and antimicrobial wipes. These items may be small enough to fit into a small pouch with the AED or within the AED carrying case itself. Abella BS, Aufderheide TP, Eigel B, et al. Reducing Barriers for Implementation of Bystander-Initiated Cardiopulmonary Resuscitation: A Scientific Statement from the American Heart Association for Healthcare Providers, Policymakers, and Community Leaders Regarding the Effectiveness of Cardiopulmonary Resuscitation.Circulation. 2008;117:704-709. Balady GJ, Chaitman B, Foster C, et al. Automated External Defibrillators in Health/Fitness Facilities. Med Sci Sports Exerc, 2002;34(3):561-564. Balady GJ, Chaitman B, Driscoll D, et al. AHA/ACSM Joint Position Statement: Recommendations for Cardiovascular Screening, Staffing, and Emergency Policies at Health/Fitness Facilities. Med Sci Sports Exerc, 1998;30(6):1009-1018. Drezner JA, Courson RW, Roberts WO, et al. Inter-Association Task Force Recommendations on Emergency Preparedness and Management of Sudden Cardiac arrest in High School and College Athletic Programs: A Consensus Statement. J Athl Train, 2007;42(1):143-158. Rothmier JD and Drezner JA. The Role of Automated External Defibrillators in Athletics. Sports Health, 2009;1(1):16-20. Thompson PD, Franklin BA, Balady GJ, et al. Exercise and Acute Cardiovascular Events: Placing the Risks into Perspective. Med Sci Sports Exerc, 2007;39(5):886-897. Valenzuela TD, Roe DJ, Cretin S, et al. Estimating effectiveness of cardiac arrest interventions: a logistic regression survival model. Circulation. 1997;96:3308 –3313.